For most consumers, the option of white or brown rice comes down to a preference in texture versus a desire for the healthy option. The two varieties are very similar– white rice is produced from brown by the removal of the outer bran and germ layers – however, producers aim to increase the similarity in terms of mouthfeel by further processing techniques on the white variety. Is there an objective method to measure the firmness of brown rice and white rice to ensure consistency and save time over a subjective sensory study? Here we demonstrate a method that enables correlation with the subjective sensory data by testing each variety of rice with a food texture analyzer. The test utilized a Food Technology Corporation (FTC) TMS-Pro Texture Analyzer fitted with a 2.5 kN intelligent loadcell and a CS-1 Kramer shear compression cell. This type of test cell most faithfully replicates the way a food item is actually consumed, in addition to allowing the testing of products in bulk form— producing more consistent results through averaging the texture across the whole sample. The rice was cooked in accordance with the supplier’s instructions and immediately placed in the Kramer shear cell to capacity. The FTC TL-Pro control and analysis software program moved the blades of the test cell down at a speed of 250 mm/min to a distance far enough to ensure that the product was completely expressed through the bottom. On completion of each test cycle, the software automatically calculated the peak compression force or ‘firmness’ of the sample. The graphical representation from TL-Pro, of the test results for the six samples, is shown here (force applied, against cumulative displacement). The two types of rice samples cluster, with the peak firmness higher for the brown variant, somewhere around 50% more firm. 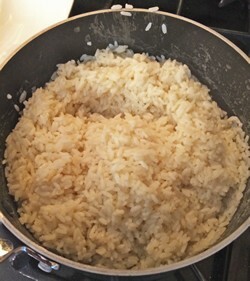 The slope rises first with the white rice, indicating slightly greater initial firmness, but this characteristic is quickly overtaken by the curves for the brown rice. This is probably explained by the starchy stickiness of the white rice’s outer surface providing more initial resistance than the smoother husk of the brown. 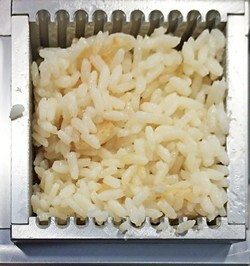 Consistency in the results, with a low coefficient of variation, demonstrates that this method of testing is a reliable, accurate and repeatable way of objectively measuring the texture of rice. The clear clustering of the two variants correlate well with the historical subjective knowledge that brown rice feels firmer. Any slight variance in each sample group is most likely a consequence of cooking time and/or temperature variations – an effect that would be present when the consumer prepares the product. The fact that the results still clearly differentiate between white and brown varieties further emphasizes the value of using a texture analyzer in the quest to produce brown rice with the preferred firmness of white.